Review Snapshot: A rain soaked, recession obsessed city is lit up by the thundering guitar of an American hero. Bruce was in town last weekend for a two night stint at the RDS. Working on a Dream, the latest offering by the Boss has done the business commercially, and there is more than a few stand out tunes to sing along to. Inevitably it's the old favourites, belted out by the show-stopping, jet-flying, limousine-riding E-Street band that folks come to see. And even in the grey & damp confines of the RDS, Bruce lit up the sky for 3 hours 20 minutes. I must confess the first time I was fortunate enough to see Bruce Springsteen live was as late as 2005 in the Point. It was the tour supporting the collection of Pete Seeger songs he recorded that year. It was excellent stuff too; pure blue grass with a tint of rock and roll and a collection of flawlessly talented, if varied, musicians. I must have been alone in my personal satisfaction as in the gents, grunting lads of a certain age were growling "Where's Born to Run? ", and "I paid for Jungleland, what's this shite?" It was then that it dawned on me. Bruce's albums sell well, even the new releases. But when it comes to Bruce live, people buy tickets, regardless of what album or cover collection he is supporting. It's a sort of religion. It was last year I began to understand this when I saw the E-Street band for the first time. So, with tickets obtained at the last minute, we went along to "The Boss". As usual, no support act. 8pm on the button, "No Surrender" is played to screams, chants of 'Bruuuuce!' and whistles of appreciation. Straight into "Badlands" and the entire stadium feels like it's moving. As I said before, it's sort of like a religious celebration. The crowd is a mixed bag as to be expected with a FOUR decade spanning career. "Lucky Day", "Outlaw Pete" and "WorkinG on a Dream" follow from the new record. The place is still buzzing. Remarkable, especially considering he is playing some of the "new stuff". 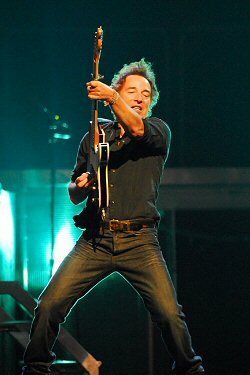 But like his live shows, The Boss' new stuff is still pushes the right buttons for many. A surprising rendition of "Proud Mary" leads into the 9/11 inspired "Waiting on a Sunny Day". Strangely the song takes on a temporary literal meaning in the recession gripped misery that is the modern Irish summer. Bruce then sound checks some famous Dublin spots. Burdocks & O'Donohues were amongst them. Two and a half hours in and "Born to Run" tears strips off the night sky. It's difficult to believe as he bounces around the stage like a teenager that this is a 59 year old man performing. The encore as with the show I had attended last year was a frenzied, screaming, dancing manic affair. “Dancing in the Dark”, “Jungleland”, “Glory days” really blew the top off the place and the entire stadium was dancing, jumping and screaming. It was pandemonium. A surprise cover of “Twist and Shout” meant Bruce and the lads could be subject to a fine for rolling past the council curfew. Never mind Bruce, I’m sure there are many who would be more than willing to chip in and cover whatever fine will be handed out! oh my god he did not forget it sunday nite.it was the the first time he played it outside the usa.if that was not good enough he went and played trapped before it.it was the best nite of my life.long live d boss. Please check out our book LAND OF HOPE AND DREAMS which tells the story of all Bruce's shows in Ireland and features 150 photos.